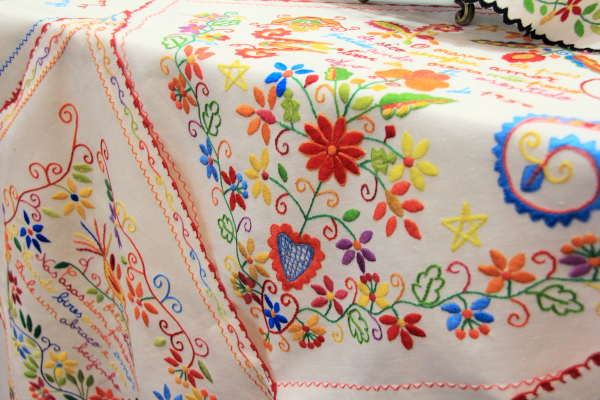 The Aliança Artesanal (Craft Alliance) cooperative, created in Vila Verde in 1988, comprises craftswomen oriented in particular towards embroidery. In 2013, the cooperative had around 100 members. 10 are employed full-time in the company’s workshops, whit a further 20 working from home. The latter receive the raw material from the cooperative and are committed to delivering their entire production to it. Furthermore, the creation of the craft cooperative has significantly helped to relaunch regional embroidery. Many women today practice this activity while keeping animals, for example, which enables them to put their time to better use. With this renewal of traditional embroidery, an essential characteristic of the area’s identity has been revived and has found a place in a market logic suited to the new consumer trends.